Pathfinders Instruments has added the new Jenco EC3175 benchtop meter to our selection of benchtop meters. 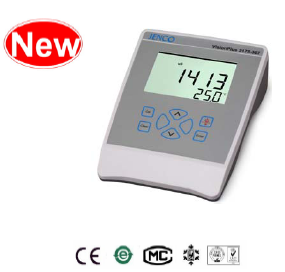 The front of the meter has a large LCD that displays Conductivity or TDS and Temperature simultaneously along with user prompts and mode indicators. The unit prompts the user through calibration and measurement procedures. It also has a new streamlined look. The model EC3175 micro-processor allows the user to easily recalibrate the parameters for the probe. A few keystrokes will adjust all the parameters for conductivity and will also give the user the option to select four types (0.01, 0.1, 1.0, 10.0) of probe cell constant for a better selection of available probes and applications. And the user can input K value of the cell by keypad directly. This meter has a waterproof IP54 case. The mechanical keys are highly reliable with tactile and audio feedback. This meter is powered by six AAA-size alkaline batteries or with a UL approved AC adapter (OUTPUT: DC9V). The meter also displays a “BAT” message when the batteries need replacement. Re-calibration is not required when power is restored. Other features include automatic conductivity ranging, automatic temperature compensation, long battery life, and 50/60 Hz AC noise rejection. The system simultaneously displays temperature in °C along with either Conductivity or TDS. The user can switch back and forth from all these displays by just pushing a single “MODE” key. Here at Pathfinders Instruments, we offer a wide selection of Benchtop Meters.